Euro road-safety target off course | What Car? Most countries in the European Union won't hit the 2010 target of halving road deaths, says the European Transport Safety Council (ETSC). The warning came following the release of the ETCS's Road Safety Performance Index (PIN) report, which compares EU member states' road safety performance to help them improve road safety. Europe needs to cut road deaths by 37% to halve road deaths by 2010, but only France, Portugal and Luxembourg remain on course to hit the target, which was set in 2001 - they have cut deaths by 43%, 42% and 38% respectively. The other EU members are lagging badly behind, with most expected to hit the target between 2011 and 2030 - and even later in some cases. The average projected finish time is 2018, but the UK isn't expected to halve road deaths until 2020. Although road fatalities are down by 20% since 2001, 43,000 people were still killed on EU roads last year. The worst news comes from central and eastern Europe - there's only a 1.6% improvement on average in Romania, Slovenia, Lithuania, Slovakia and Poland. Lithuania is the worst in the EU for road deaths - the statistics have barely changed since the mid-1990s. Latvia is the only country among the new member states with a reduction in road deaths of 25% over 2001-2007. The ETSC is also worried by the number of countries recording a rise in the number of people killed on the roads compared with 2006, including countries with a long tradition of road safety. These countries include Denmark (up 34%), Finland (up 12%), Sweden (up 6%) and Switzerland (up 4%). Poland also had a 7% increase, setting it back to its 2001 level, and the Czech Republic recorded a 15% rise - disappointing, considering its 17% improvement the year before. The only good news came from Ireland and Spain, which managed to cut road deaths by 7%, and from Italy and Hungary, which cut deaths by 6%. Britain has only managed an 8% cut in road deaths between 2001 and 2007. 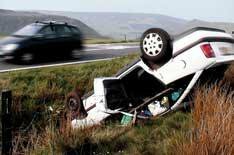 3300 people were killed on British roads in 2006 (the most recent figures available).